This may be yet another Beauty and the Beast retelling but it is one of the best I’ve come across. I absolutely loved the new spin the author put on this classic tale and main character Harper is truly awesome. 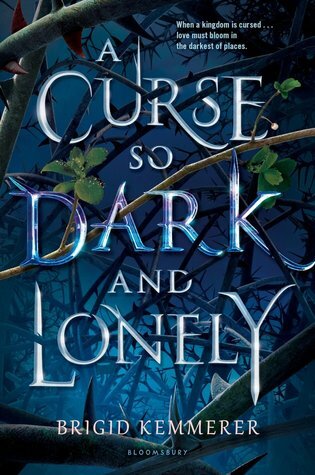 I absolutely adore retellings, reading pretty much every one I can get my hands on, but even I have to admit my first thought on seeing this was not another Beauty and the Beast retelling. I must have read at least a dozen of them so it was difficult to see how Kemmerer was ever going to make this one stand out. Somehow however she does and I can say, hand on heart, that this is one of the best versions of this classic tale I’ve come across. It may be based on a story we all know and love but the author has put her stamp on it and turned it into something a little bit different. There’s no beautiful but misunderstood young girl held captive by a hideous monster who turns out to be nice on the inside and they fall in love. Instead we have a contemporary heroine who accidentally manages to get herself kidnapped and transported to a new and magical world. There’s no beast either as the prince she meets is handsome and charming and maybe just a little too smooth. There is a curse placed upon him (it’s in the title) but this curse is that he’s doomed to repeat the same season over and over again until he manages to find someone to fall in love with him. At the end of the season, if he hasn’t found true love he is transformed into a terrifying beast who will kill everyone and everything in sight before time resets and he begins the season anew. It really is a wonderful take on the story and I absolutely loved this notion of time repeating for Prince Rhen and also the sense of urgency his impending transformation brings to the story. I loved that the enchantment caused everything within the palace to repeat despite Rhen and captain of the Guard Grey being the only ones there. Food magically appears at certain times, rooms tidy themselves and musical instruments play the same music they did for Rhen’s first season (even without the musicians). There’s something wonderfully magical about it but it’s also a little bit sinister too. What truly made this book for me however was main character Harper. I think she may possibly be one of my all time favourite characters. From the very start she has incredible strength and resilience and over the course of the book she develops into something even more, finding confidence and self assurance. Physically she’s not perfect, she has cerebral palsy which limits what she can do and means she struggles with a lot of things, but while it does slow her down at times it doesn’t curb her determination. I truly admired how she coped with everything thrown at her. She’s magically transported to a new and more primitive world, is held captive in a cursed palace, becomes entangled with local politics and has the incredible pressure of being told she can save a kingdom on the brink of war. She has the odd wobble (fair enough I would too) but she doesn’t wait around for someone else to rescue her or fix things but instead steps up and does it for herself. Yes she does do some incredibly stupid things and doesn’t always listen but she acts which in my opinion makes her awesome. Her relationship with Prince Rhen is also very well done. For a Beauty and the Beast inspired story it’s pretty light on the romance, there’s no insta love here or even an instant attraction. Harper isn’t naive and knowing about the curse pretty early on she never buys into his charm (and actually calls him on it). They bicker and they fight as neither wholly trusts the other and I have to admit I was never fully sure their relationship would turn romantic (and I wasn’t sure I wanted it to). Rhen is an intriguing character but his guarded and thoughtful nature make it difficult to really become invested in him. He doesn’t show much of what he feels and to be honest he’s so dispirited and defeated at the start of the story that it’s not clear he feels much at all anyway. He does develop over the course of the book and by the end I did come to really care about him but I’m still not sure I ever really felt like he and Harper made the best match. Captain of the Guards Grey however I almost instantly loved. From when he first accidentally kidnapped Harper for Rhen there was just something about him that made me happy. He’s incredibly loyal, brave and stoic but there’s a really soft and fun side to him that I thought made him a better match for Harper. Some of my favourite moments in this book were in fact between him and Harper which is probably not the way it should have been. The writing is great and I thought the pace of the story was pretty much spot on. It’s a fast and easy read and there’s just enough intrigue and action to keep you hooked throughout. I loved the world building and while some of the secondary characters were a little stereotyped there was enough depth and complexity in the leads to make up for it. I will say I wasn’t wholly convinced by Harper’s back story and family and it felt a little bit forced to fit what the story needed but given how much I loved Harper I can let it slide. Overall therefore, this is one of the best retellings I’ve come across and one I’d recommend all lovers of the genre pick up. The ending left things a little bit open so I can’t wait to find out what’s next for these characters. Thanks to NetGalley for providing me with an ARC. As always all views are very much my own. I hope you enjoy it when you do. That’s great that this was such an excellent beauty and the beast retelling!! I really like the sound of this unique take on the story. And the main character sounds especially awesome. Good to know about the open ending. Wonderful review!